T Severn & Sons Ltd.
Not the best of shots, depot shots very rarely are especially if shooting towards a window. But I think it is worth it as these vehicles were owned by another of the many independents operating in the Doncaster area mainly serving the mining industry. At one particular time T Severn & Sons were one of five operators based in the small village of Stainforth, just shows how big the mining industry was in that area. But I will not dwell on the history as apart from the usual Peter Gould website there are two other sites I have found dealing with the Doncaster independents I have put links to them below. T Severn purchased two of these Reliances PYG 605 and 606 new in 1956, one interesting thing I found out from their fleet list was that 606 was withdrawn in 1963 but 605 stayed on until being withdrawn in 1970. I somehow cannot see the early withdrawal due to vehicle deteriorating so I presume it was because of the increase in passenger numbers and vehicles with an higher capacity were required. The reason I came to that conclusion is that in the 1963/4 period Severns acquired two new and three second hand double deckers, one of them ex London Transport RT331 as well as two coaches. One of the new vehicles is in the above shot, new in 1964 BWW 654B a Leyland Titan PD3/4 with a Roe front entrance body, this vehicle passed onto SYPTE in March 1979 and was numbered 1156 in their fleet. Here are the two links for the history of the Doncaster independents as the links are rather long I have made things easy so there is one here and another one here. A full list of Reliance codes can be seen here and Titan codes here. I think these two vehicles were always ‘dual purpose’, having seats with headrests, but were delivered in plain green/cream livery with straight mouldings. This was altered some time later to the style shown, possibly because neighbour Felix had a Reliance later on with V moulding on the front and Severn had to keep up! As to why one vehicle lasted 7 years longer than the other, we can only guess but Severn’s did odd things sometimes such as going to the trouble of having a PD1 re-bodied, then selling it only three years later, also buying a Bristol K5G into a fleet which had by then virtually standardised on the Leyland O600 in it’s double deckers. 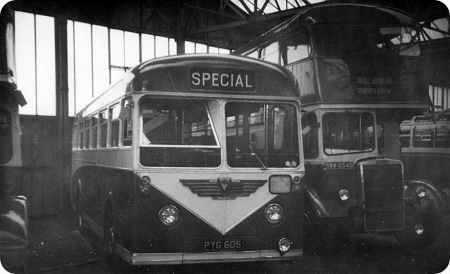 I believe PYG 606 came to Mowbrays, South Moor, part of the Diamond syndicate, I have photographs of this one in service on the Stanley/Durham service, I drove part time in 1961/63? but never drove this one.